Have you ever felt like your heart was going to burst from behind your ribs and somehow break through your chest and fall to the floor? Well, that description might be a bit of an exaggeration for some, but there are those of us out there that know the situation I described can feel very real. I suffer from anxiety, this is no secret nor anything I brought upon myself. There are several ways I like to battle anxious feelings. Exercise works well, a good walk with my dog, a few pages of a good book, a few yoga poses, meditation, and essential oils. Aromatherapy has been introduced to me at different times in my life, and I remember it was typically when I was feeling anxious. 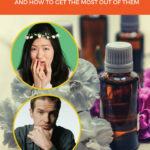 I did some digging and found that the scents listed below are the best essential oils for anxiety.